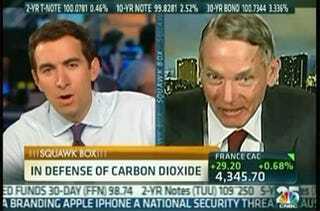 During an appearance on CNBC, Physicist William Happer was asked about his view that human beings are not causing climate change. His response: "The demonization of carbon dioxide is just like the demonization of the poor Jews under Hitler. Carbon dioxide is actually a benefit to the world, and so were the Jews." I keep hearing about the "pollutant CO2," or about "poisoning the atmosphere" with CO2, or about minimizing our "carbon footprint." This brings to mind another Orwellian pronouncement that is worth pondering: "But if thought corrupts language, language can also corrupt thought." CO2 is not a pollutant and it is not a poison and we should not corrupt the English language by depriving "pollutant" and "poison" of their original meaning….CO2 is absolutely essential for life on earth. "This is George Orwell. This is the 'Germans are the master race. The Jews are the scum of the earth.' It's that kind of propaganda….Carbon dioxide is not a pollutant….To say that that's a pollutant just boggles my mind. What used to be science has turned into a cult." It's bad enough that news outlets continue to give "equal time" to scientists whose views are completely at odds with 97 percent of the scientific community—but do they now also have to include crazed charlatans? As the liberal watchdog group Media Matters observed: "CNBC might also be able to find a few scientists who question whether HIV causes AIDS, whether secondhand smoke is dangerous, or whether vaccines cause autism —as all three have a few contrarian "experts" supporting their cause —but it wouldn't be responsible to give them a platform."